One Direction star Louis Tomlinson's deal to take over Doncaster Rovers football club is off, according to the businessman he was working with. John Ryan told the BBC the deal had collapsed because the Football League were not happy with the plans presented to them. "Louis and I were just looking to do the right thing," said Ryan. Ryan and Tomlinson were expected to complete their takeover this week. 22 year-old Louis is a lifelong Rovers fan and played for the club's reserve side against Barnsley earlier this year. 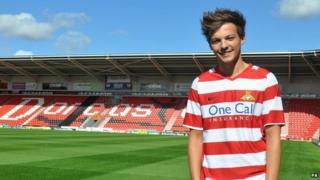 1D's Louis played for Doncaster - who would you have?